Does your company like to keep your clients posted about News items? Or maybe you provide articles that you want posted on your site. This is a perfect Category type for that. 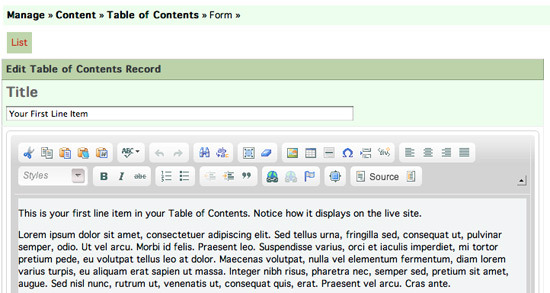 Take a look at the content area of a Table of Contents page. It looks quite similar to a General Content Page at first. What you see at the top of the content editor for this Content Type, is an editor for the introductory paragraph at the top of the list of downloadable files. Maybe you need to explain what the downloadable files are about here. Wait until after you have added an item to your Table of Contents before you complete the intro paragraph. Click the Add button to add your first line item to your Table of Contents. Again, you are taken to a text editor. Name the link to go on the table of contents page in the title bar. Then add the content that that link will click through to into the content editor below it like this. Make sure you save this line item at the bottom of the page. Click Add again to add additional line items to your list. Notice at the bottom of the main Table of Contents page that a list of your line items now shows at the bottom. Watch the demo to see the above content as it was input into the CMS. Once you have more than one line item posted you can use the Sort button to resort them into the order you want them in. If you don't sort them, they will auto-sort in the order you input them in. Use your imagination to come up with the many uses for the Table of Contents content type.